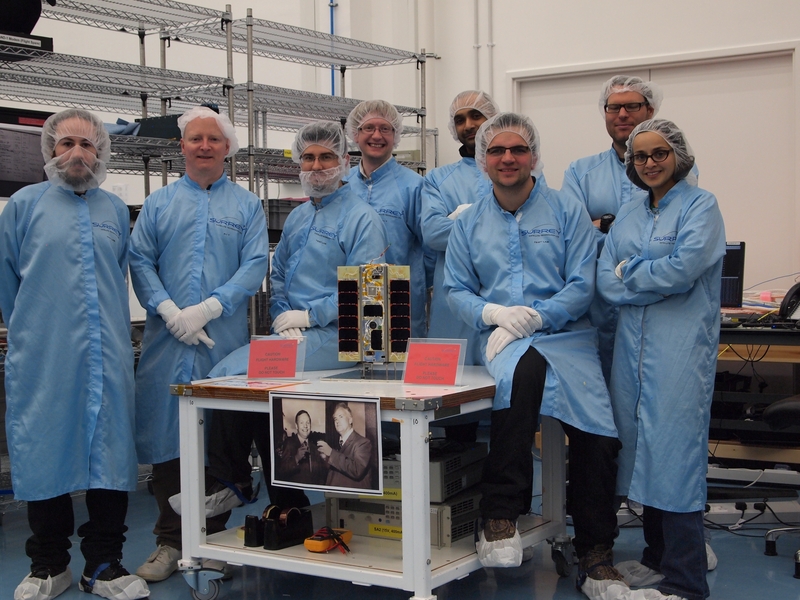 The first UK CubeSat, STRaND-1, was launched on Monday, February 25, 2013 at 1231 UT on the PSLV-C20 rocket from the Indian Space Research Organisation (ISRO) Satish Dhawan space centre. Deployment from the launch vehicle into a 785 km orbit took place about 20 minutes later. Signals from STRaND-1 were received by radio amateur Nader Omer ST2NH in Sudan at 1555 UT and by the Surrey Space Centre (SSC) later that evening. 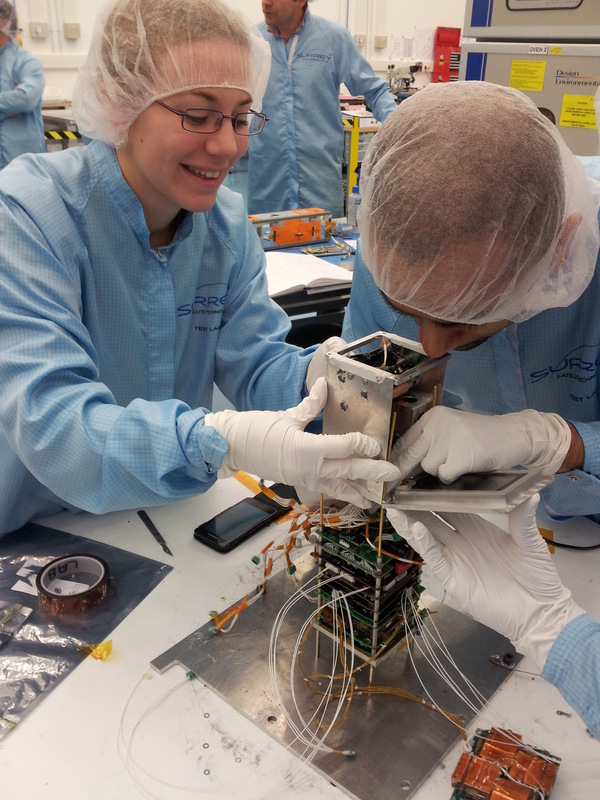 The innovative STRaND-1 CubeSat was built and tested in just three months. It will demonstrate the feasibility of using cheap smartphone electronics to control a spacecraft. STRaND-1 carries an amateur radio AX.25 packet radio downlink on 437.568 MHz using 9k6 bps FSK modulated data HDLC frame, NRZI encoding. Information on decoding the telemetry is available here. Watch the videos in the STRaND-1 video archive. 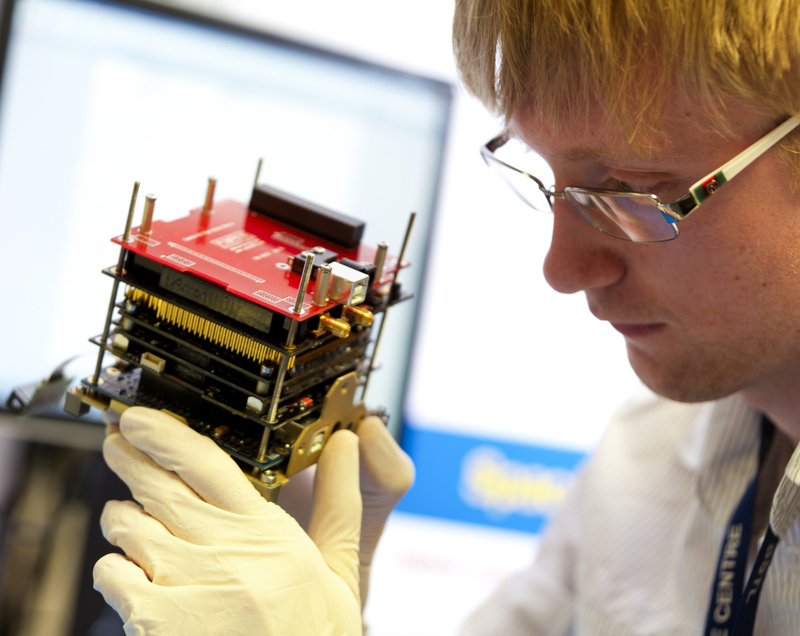 During the first phase of the mission, STRaND-1 will use a number of experimental ‘Apps’ to collect data whilst a new high-speed linux-based CubeSat computer developed by SSC takes care of the satellite. 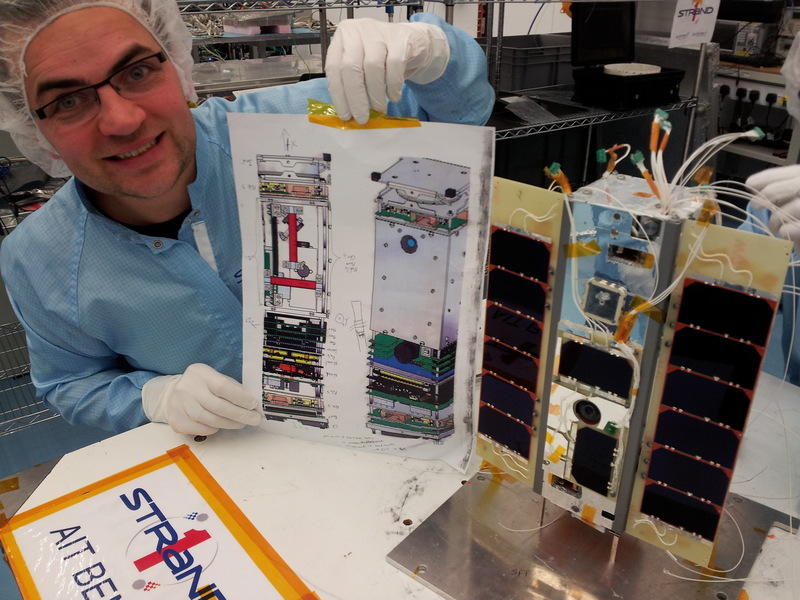 During phase two, the STRaND-1 team plan to switch the satellite’s in-orbit operations to the smartphone, thereby testing the capabilities of a number of standard smartphone components for a space environment. 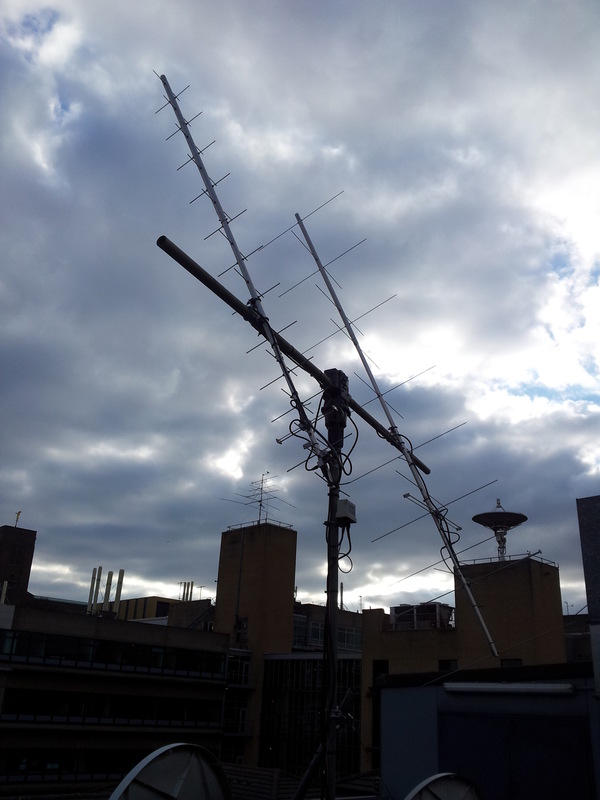 The satellite is operated from the Surrey Space Centre’s ground station at the University of Surrey. It is planned to take images of the Earth from space, and when in range of Guildford, Surrey downlink a compressed digital version of the image on 437.568 MHz using the Saratoga protocol, Further information on the protocol is here and here. Space technology experts from Surrey Satellite Technology (SSTL) and the Surrey Space Centre (SSC) at the University of Surrey selected the four lucky winners of the ‘Space App Competition’ who will see their Android Applications run on STRaND-1. Testing the theory ‘in space no one can hear you scream’ – made popular in the 1979 film ‘Alien’ – the ‘Scream in Space!’ application developed by student-run society Cambridge University Spaceflight will make full use of the smartphone’s speakers. 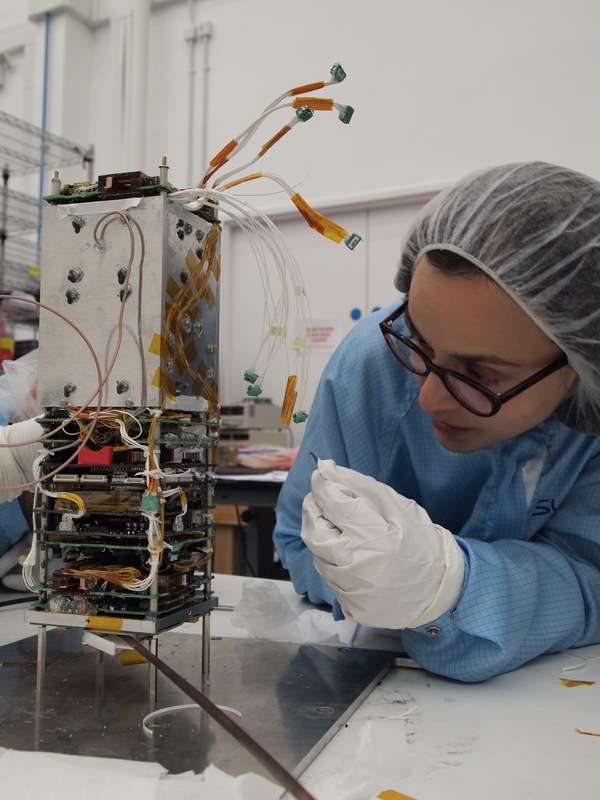 STRaND-1 is the first CubeSat to have two types of propulsion system, a Pulsed Plasma Thruster (PPT) system and a WARP DRiVE (Water Alchohol Resistojet Propulsion) system that will help the CubeSat to perform manoeuvres. WARP DRiVE works by pushing water alcohol out of a tiny hole (just 0.2mm across) to produce thrust. The main advantage of this system is that it’s much smaller than regular space propulsion systems measuring in at about the same width as a drinks coaster. The WARP DRiVE will also provide more thrust than other similar systems whilst maintaining a comparable specific impulse (the efficiency of the propulsion system). The Pulsed Plasma Thruster (PPT) system consists of eight micro thrusters; four located at the top of the satellite stack and four located at the bottom. The micro thrusters operate by discharging a discrete train of pulses. Each pulse is a plasma discharge that forms between two metal electrodes, much like a small lightning bolt or electrical spark. The spark erodes the metal from the electrodes and electromagnetics accelerate the eroded mass out of the nozzle, which produces thrust. This is known as the Lorentz force. Surrey Space Centre has developed two ways of minimising mass and volume. Firstly, the electrodes which form the plasma discharge also function as the propellant. As metal is highly dense, more propellant can be stored in a smaller volume than that of conventional chemical propulsion systems. The total weight of the propellant for the whole STRaND-1 PPT system is just 10g. Secondly, Surrey Space Centre’s novel discharge initiation system uses a mechanical contact trigger built out of a tiny piezoelectric motor only 5mm in length. This takes up less space than the conventional spark plug system which requires volume intensive circuitry. STRaND-1 was carried on the Indian Space Research Organisation (ISRO) PSLV-CA (PSLV-C20) rocket and launched into a 785 km orbit on February 25. The STRaND-1 downlink frequency is 437.568 MHz using 9k6 bps AX.25 packet radio.